China Will Designate All Fentanyl-Related Drugs As Controlled Substances Some manufacturers evaded scrutiny by slightly modifying the molecular structures of substances. Monday's announcement "puts a wider array of substances under regulation," a Chinese official says. 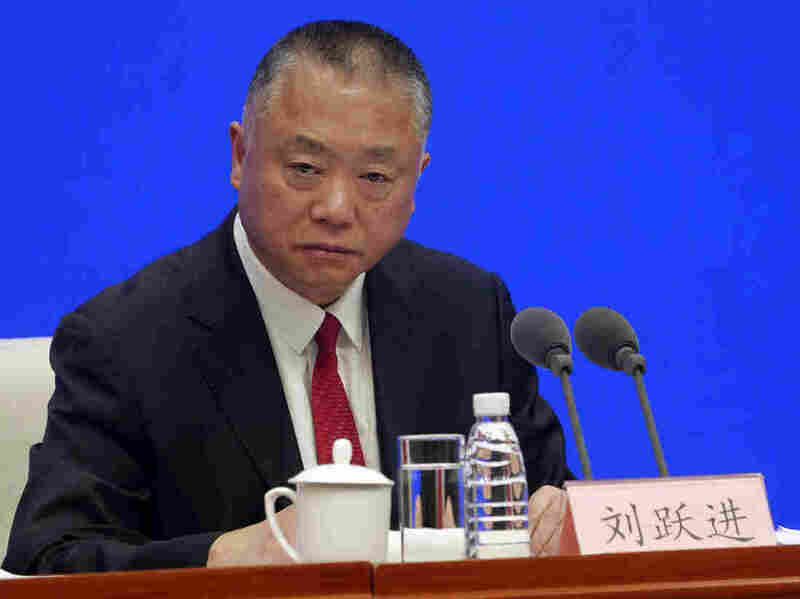 Liu Yuejin of China's National Narcotics Control Commission speaks at a Beijing press conference on Monday. He announced that all fentanyl-related drugs will become controlled substances, effective May 1. The decision to regulate all fentanyl-related drugs as controlled substances "puts a wider array of substances under regulation," Liu Yuejin, an official of China's National Narcotics Control Commission, said at a press conference in on Monday. The regulation will take effect May 1. Bryce Pardo, a drug policy researcher at Rand Corporation, tells NPR that in theory, the regulation "future-proofs the law" by including impending chemical modifications. But China may not be able to enforce the new rules, Pardo says. "[Authorities] already have problems enforcing existing laws." He says official reports show the country does not have enough inspectors for facilities, and law enforcement would have to "take a sample" from a facility and eventually "analyze whether it's a fentanyl-related structure." Vanda Felbab-Brown, a senior fellow at The Brookings Institution who focuses on illegal economies, tells NPR the regulation is "a good step," but whether China "will have the will and the capacity to do it is a big question." The United States and China have been negotiating for better drug control since the Obama era, she adds. In the midst of the trade war with the Trump administration, "China is looking for one area where it can still continue cooperating with the U.S.," Felbab-Brown says. Liu denied on Monday accusations that China is a major contributor to the U.S. opioid crisis, saying Chinese law enforcement has "solved several cases" of illegal fentanyl-related drug manufacturing and distribution. "They are all shipped to the U.S. by criminals through evasive means, through international packages," Liu said. "The amount is extremely limited and cannot be the main source of the substance in the U.S."
He said the U.S. opioid problem was mainly caused by "domestic reasons," according to the South China Morning Post. According to a 2018 report by the U.S.-China Economic and Security Review Commission, China remains "the largest source of illicit fentanyl and fentanyl-like substances" in the United States and "illicit manufacturers create new substances faster than they can be controlled." Felbab-Brown says China's new stance on fentanyl-related substances stems partially from a desire to be a global enforcer on drugs. "From a public relations perspective, it's difficult for China to be accused of being a source of drugs," she says. China does not have a monopoly on fentanyl production, she adds. "Even if tomorrow the United States wouldn't get fentanyl from China, others would step in. Most obviously India, a major source of addictive drugs." Huo Jingnan contributed to this report.